Hello! 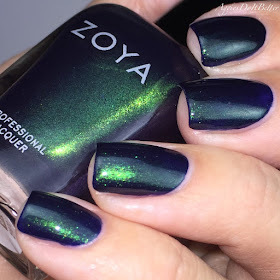 Today I have the Zoya Enchanted collection to share. Zoya typically puts out smaller 6-polish collections around the holidays and they are almost always stunners! This year is no exception! Saint is a periwinkle polish with a super strong duo chrome (shift to purple) and shimmer. It's quite beautiful and I can honestly say I have nothing else like this! It looked to be a little sheer on the first coat but covered completely in 2, and my nails are a little longish right now because I've been growing out a break. I'm not as nutty as most on the duo-chrome polishes but this one is magnificent!! This is Olivera. Get familiar with the name, you guys all need to go out and get her RIGHT NOW. Guys! 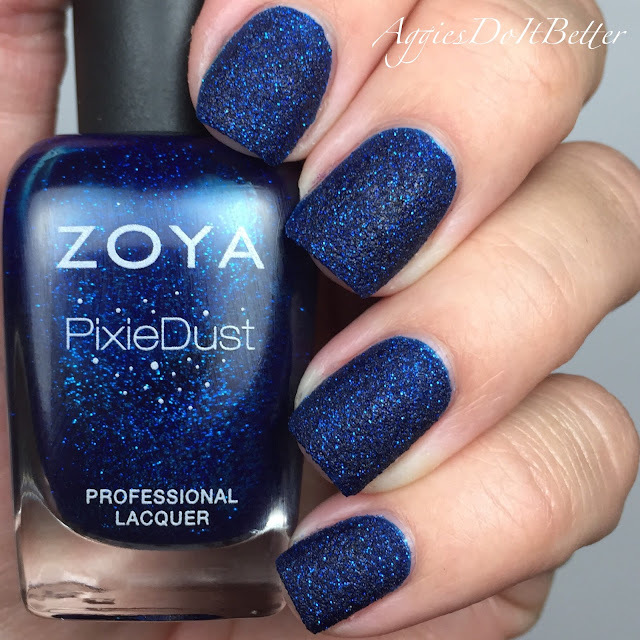 This polish is unbelievable! 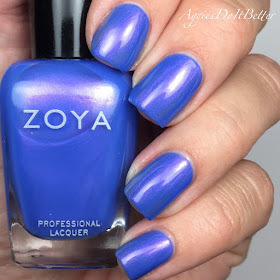 This is ONE COAT with topcoat. I will say always be careful to avoid your skin on such opaque polishes! 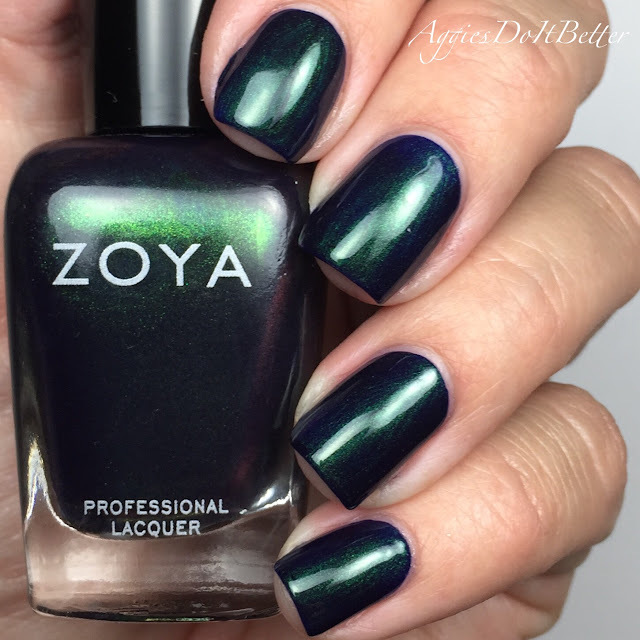 It has such a blue-green shift it looks like oil spilled on your nails. How insane is it?? There's not much sun here at the moment but as soon as we get a sunny day this is going straight back on my nails. And my toes. And anything else I can find. This collection introduces 4 new Pixiedusts! 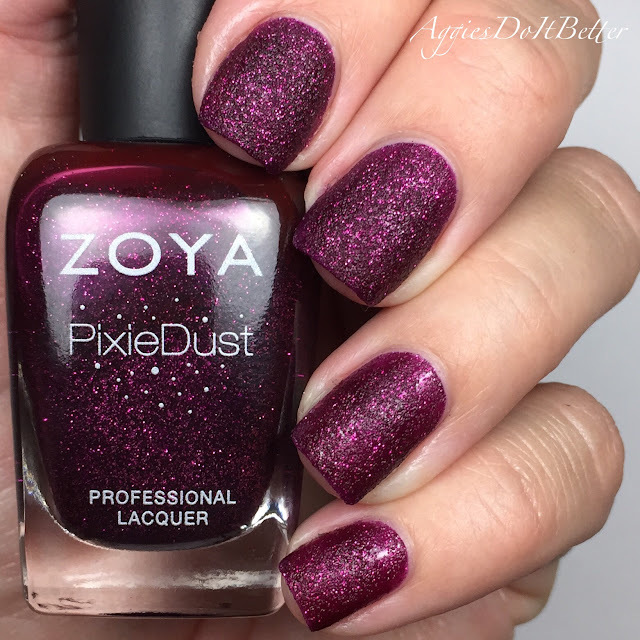 A lot of us are confused because a little while ago Zoya announced they were discontinuing all their pixies. I mean, they didn't say they were done with them forever but that's what most of us assumed. Since then they've come out with a bunch of new ones! I'm so glad Zoya is still doing textured polishes, I'm still all aboard that train!!! 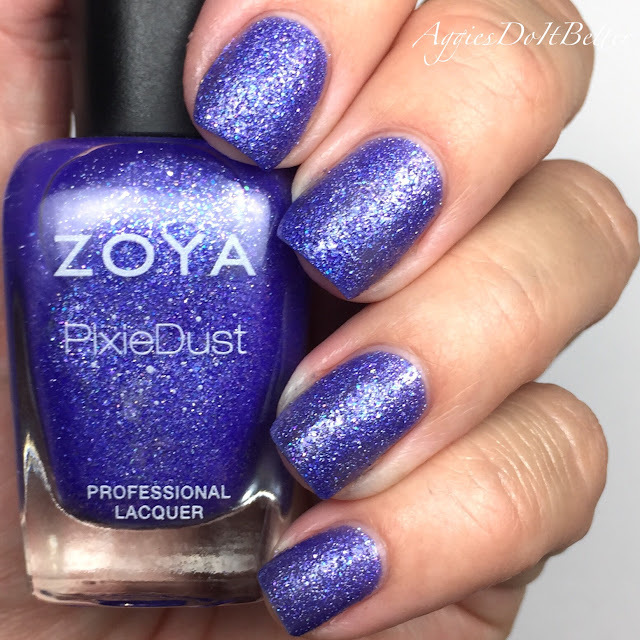 Alice is a periwinkle pixiedust. 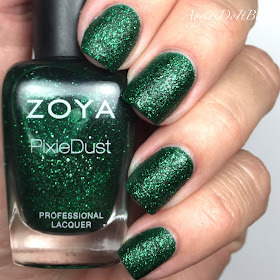 I have tons of textured polishes and none in this color! It doesn't seem to dry down as matte as the others, maybe because of the different kind of shimmer in it. It looks not quite dry in the picture but it is! That's ok with me! This is 2 coats, I thought it looked fine at the time, but it could probably use 3. These new pixies seem to be not as opaque as the older ones. 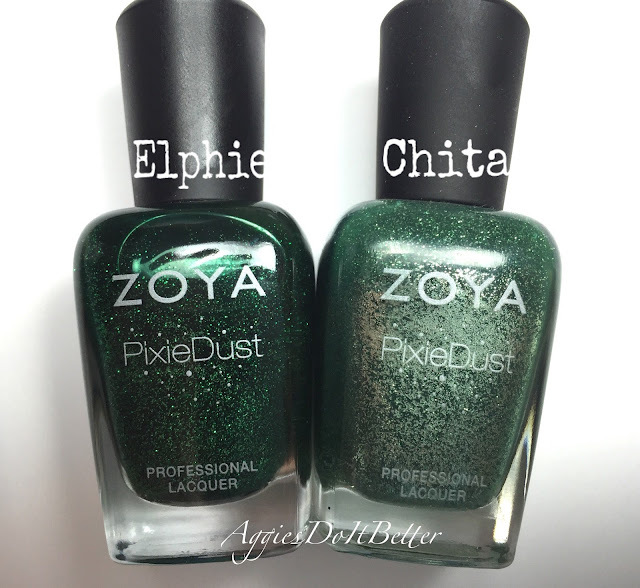 Elphie is an emerald green pixie dust. 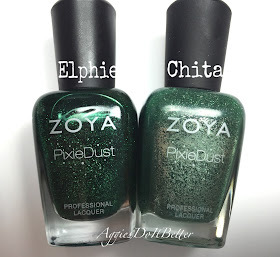 It is similar to Chita except it has darker green shimmer instead of silver. This is 3 coats. Chita is almost opaque in one coat, for reference. Here's a little bottle comparison. 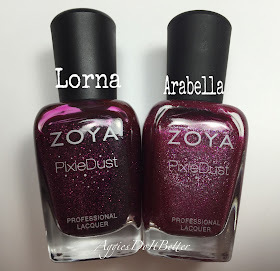 Lorna is a gorgeous berry pixiedust. I never tire of this color! This is 2 coats. Here's a little bottle shot comparison with Arabella, the closest to a dupe I have. 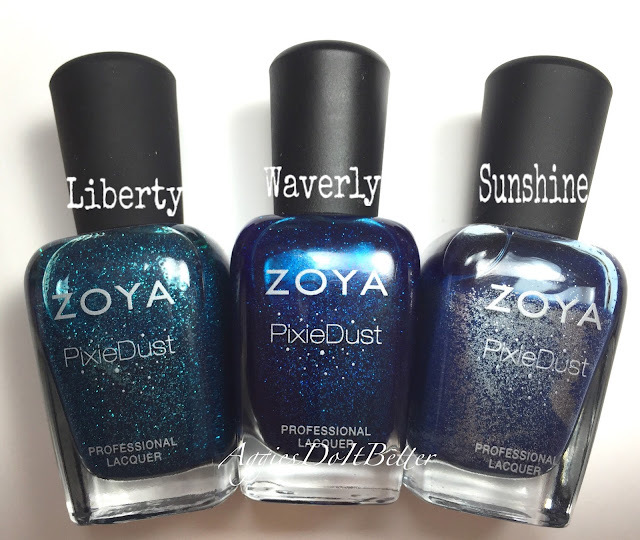 Waverly is an amazinggggg emerald blue pixiedust. This is 2 coats. Waverly is by far the most opaque of the bunch, the formula is much thicker than the rest (in a good way). 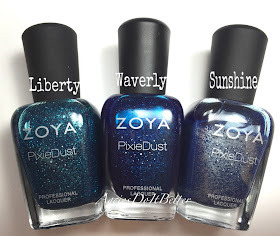 If Zoya would just put out a turquoise pixie my life would be COMPLETE! The Enchanted collection is available at Zoya.com now, be sure to follow all their social media because they frequently out out great deals and specials! !